Actually I wanted to make scallops with endives and incorporating orange juice in the recipe, unfortunately I ate all the oranges so I had no choice and had to change my original idea or run to the store which was not an option. Scallops are called Noix de St Jacques in France, and the smaller ones, the bay scallops are called pétoncles. Most of the time, in France we buy scallops in their shell with their red coral. I don’t know why in the US they get rid of it, I’m sure there must be a good reason. The caramelized endives are wonderful with those sea scallops, the sweetness added by sugar and bitterness of endive balance perfectly the curry flavor. I really love this scallop recipe and for scallop lovers, it really needs to be tried. For the scallops, pat them dry to remove excess water. 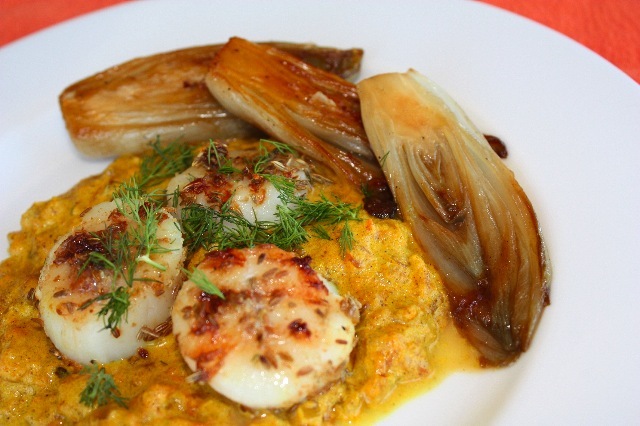 Crush fennel and cumin seeds in a mortar and dip scallops in the mixture, remove excess seeds. In a pan, heat olive oil, add shallots, and let them brown. Add curry powder, stir for about 5 min. Add tomatoes, cook for about 10 minutes then add heavy cream. Stir, add salt and pepper, cook for a few minutes until the cream has thickened a little. For the endives, wash them, cut them lengthwise, pat them dry to remove water. In a pan, add butter, and place endives flat side down, let them brown on both sides, then sprinkle with sugar and cover and let cook for about 15 minutes. Grill the scallops in a grill, grill on both sides. Spoon 2 tbs of tomato curry sauce in a middle of a plate, top with scallops, sprinkle with dill and add endives on the side. This entry was posted by silvia on March 24, 2009 at 3:28 pm, and is filed under Fish/Seafood. Follow any responses to this post through RSS 2.0.You can leave a response or trackback from your own site. We have Nantucket bay scallops only available for a few weeks in November that ate so sweet and amazing you can eat them right out of their shells. They are pricey (about $30/pound), but worth the treat. I just might try them with this recipe….love that little bit of warmth in the curry sauce. 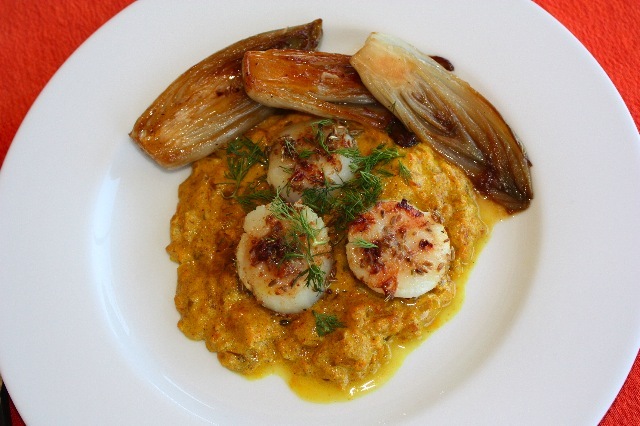 i love the idea of hving scallops with curry tomato and endives!!!! your dish makes me drooling!